When I bought the car, there was almost a full year left on the plates, and I simply transferred it to my name. But this period was fast approaching, and I made an appointment with the AA for a full inspection. The condition of the car deteriorated with daily use. Knocking noises started appearing in the suspension under cornering and from the back there were some very faint bearing noises. I sort of expected that the car wasn't actually road worthy, and a test at the AA proved my suspicion. Because I bought the car it did require a new road worthy certificate. Now at least I had a list of immediate issues to look at. After the calamities with the engine and its subsequent replacement, a few of the items on that list were knocked off, one of which was oil seeping out of the crank seal at the front. Presumably the same happened at the back, since the old clutch was slipping quite often. Mostly though, the problems were all due the car having sat in a garage for a long time. When this happens, the rubbers start to loose their suppleness and become brittle. So when it actually gets to being driven again, the rubbers immediately starts tearing and breaking apart under the stresses. My shopping list was basically a refitting of the entire undercarriage: New polyurethane bushes and anti roll-bar mounts, new ball joints and new dampers. The old dampers didn't leak oil, but they were 20 years old by now and had seen a significant amount of gravel road. The effort of replacing all the bushes was outside the scope of my own abilities and the tools in my garage. The poly bushes are very difficult to get into the wishbone mounts, so I delivered the car to a shop where they could use a press. They didn't do a very good job though. 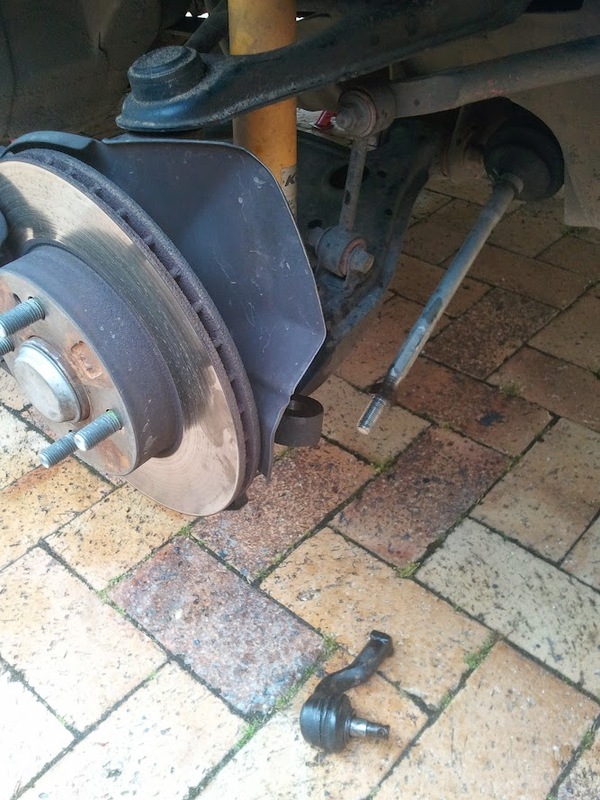 The bushes were fitted well enough, but the rear anti roll-bar lost one of its bolts and I found another bolt on the one wishbone that also hadn't been fastened properly either. I then subsequently heard, quite by coincidence, that this shop refurbished the brakes on another car which failed mere days afterwards and resulted in a terrible accident. So of course I double checked everything on the undercarriage. Real sloppy work. So after the bushes were sorted out, I turned my attention to the bearing noise that permeated into every drive. Initially I wasn't too sure that it was actually a wheel bearing, and opted to first replace the rear brake disks and pads. They could have been warped at some point and anyway, the pads were done, so it needed doing. The green stuff fitted to the rear. As it turned out, it wasn't the brakes, but the hubs are rather expensive and weren't necessary for the road worthy certificate, so I let it be for now. The lower ball joints on the front are sold separately, so I got those new. But the upper ones are only sold attached to the upper wishbone. This makes it rather expensive (and also rather silly, because the wishbone itself doesn't really deteriorate). These I had refurbished instead. For the dampers and springs I borrowed a compressing tool and set about building the new dampers and springs. It is rather difficult to manage when you're working on the floor. I had ordered Koni sport dampers, which are adjustable in height and stiffness. The poly bushes had made the ride so stiff all on their own, that I didn't really mess with the damper settings at all. Lowering the car would have made the ride way too hard. Remember that this car weighs less than 1 ton, and the poly bushes props it up so well it doesn't lean into the corners nearly as much as with stock rubber. So, the dampers were really just an extra, and for peace of mind. Also, I'm not into stancing or any of that stuff. This car was meant to be a daily. One of the problems of old cars like this is rusted nuts and fasteners. The one front damper unit wouldn't loosen on the top cover. It had rusted down so bad that I couldn't dismantle the damper unit at all. 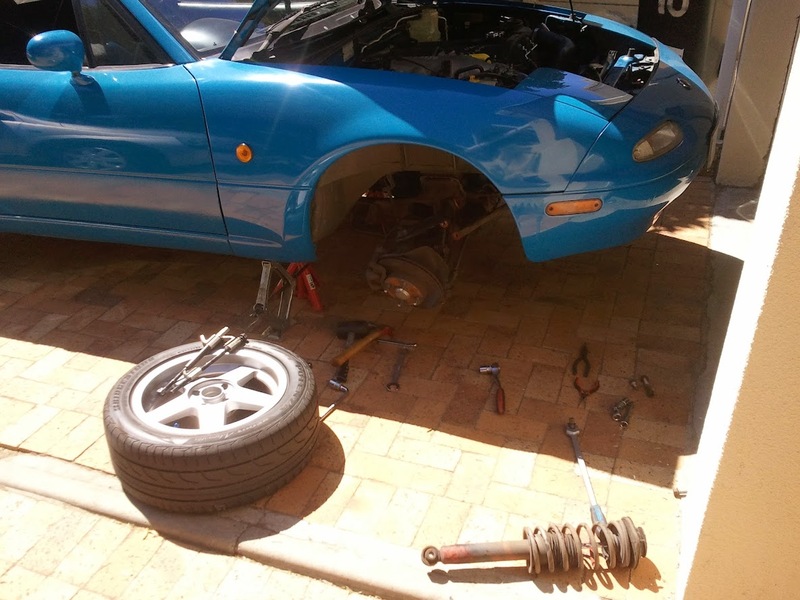 I moved on to the rears units, and by the time I completed and fitted the those it was already mid Saturday afternoon. I needed the car ready on Monday morning for work. At this point I desperately called in some friends to come and help. The solution finally turned out to simply split the rusted nut using a chisel. This of course woke up all the neighbours on the Sunday morning, and the chisel was totally wrecked. And I had lost a nut, which is actually a bigger problem than you might think. You don't just go to the hardware store and buy nuts to use. These nuts' and bolts' thread are not compatible with general hardware store types, and I don't have a huge stash of lost nuts and bolts like many workshops have. I can't remember where we got another nut that fit though, but fortunately it was all sorted out by lunch time on the Sunday. After this the car passed roadworthy, but there were a few other things that needed attention, and naturally some more surprises were in store for me. Official bodies (racing, club, secretariats) won't classify the NA Miata as a classic yet, even though it's now well past 20 years. I've heard of it being referred to instead as a "modern classic" though. I don't really care either way, I'm just here to drive and own this car.